learn what are right triangles. In this lesson, we will learn about right-angled triangle (RT). 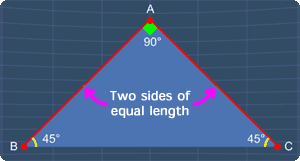 For a triangle, to be called a RT, one of its internal angles must be 90 degrees. Now, let's move vertex 'A', and see what happens. Notice that, when the angle at vertex 'B' becomes 90 degrees, this triangle becomes a RT. Next, let's move this vertex, to the right. Here, we get another RT, when the angle at vertex 'A' is 90 degrees. Let's continue. Again, we get another RT, when the angle at vertex 'A' is 90 degrees. 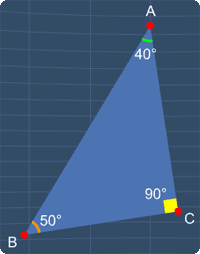 As we move vertex 'A' further to the right, the angle at vertex 'C' becomes 90 degrees. Therefore, we have another RT. Now, observe the different sizes of a RT, when we move the vertex 'A' and 'C' together. Notice that, one of the internal angles is 90 degrees. Therefore, this is a RT. Next example, how about this triangle? Now, none of these angles are 90 degrees. Hence, this is not a RT. You can start by going through the series of questions on right triangle or pick your choice of question below.